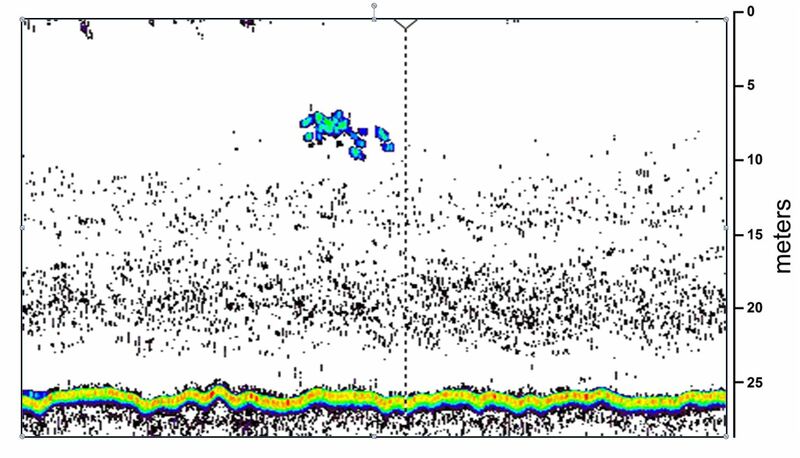 Since July 2010, we have tested the feasibility of using high resolution, split-beam sonar aboard OSI’s RV Yellowfin to assess the distribution, abundance, and biomass of barred sand bass (Paralabrax nebulifer) at the main spawning aggregation site in Southern California. Ten to 18 randomly chosen, replicate, sonar transects were conducted in July and August of 2010 and 2012 at Huntington Flats to conduct analyses of target identification, spatial location, target frequency analysis, target strength, and, ultimately, integration of target numerical density and biomass with defined regions of the daily cruise track. Utilizing sonar recordings of the tethered fish, the mean target strength of barred sand bass was determined to be -35 dB as was the case in our July 2010 survey. During the three-day period of sampling, a total of 117 groups of barred sand bass were identified in the water column between 1000 and 1500 hrs. Groups ranged in size from 1 to 350 individuals with the vast majority of the groups containing less than 10 individuals. Estimated barred sand bass abundances varied between 146 and 651 sand bass per hectare over the three days of assessment in July 2012. Averaging 0.5 kg each, this corresponded to a range of standing stock between 73 and 325 kg per hectare (Table 1). 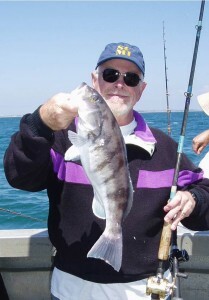 The estimated harvest of barred sand bass by the recreational fleet present at the site during the survey period was less than 1 % (0.63%) of the standing stock (560,000 sand bass) estimated by this sonar technique for the three-day period. Therefore, the potential impact of angling at the current, 2012 capture rate appears to be minimal off the Huntington Flats. The largest groups were found almost exclusively between 5 and 10 m resulting in a highly significant, negative correlation between group size and depth. It is clear from these data that the largest, presumably spawning groups of barred sand bass occur up in the water column at depths between 5 and 10 m. Our results suggest that sonar is the best way to assess standing stock of barred sand bass aggregations and a new series of monitoring surveys are again being conducted this summer (2014). Figure 1. Sonar target verified as barred sand bass aggregation in water column by rod and reel sampling (6-10 m depth); 22 July 2010. Figure 2. 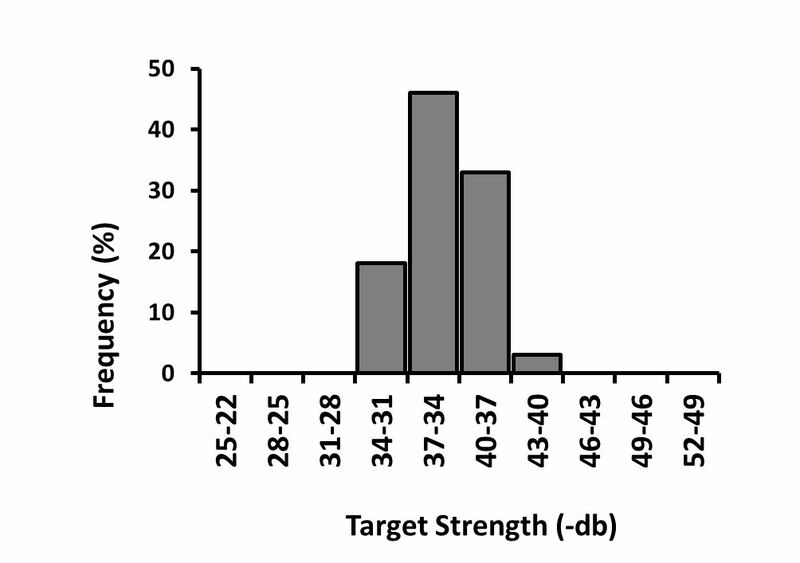 Frequency of occurrence of target strength scores for tethered barred sand bass on August 6, 2012 at a frequency of 206 kHz. Figure 3. 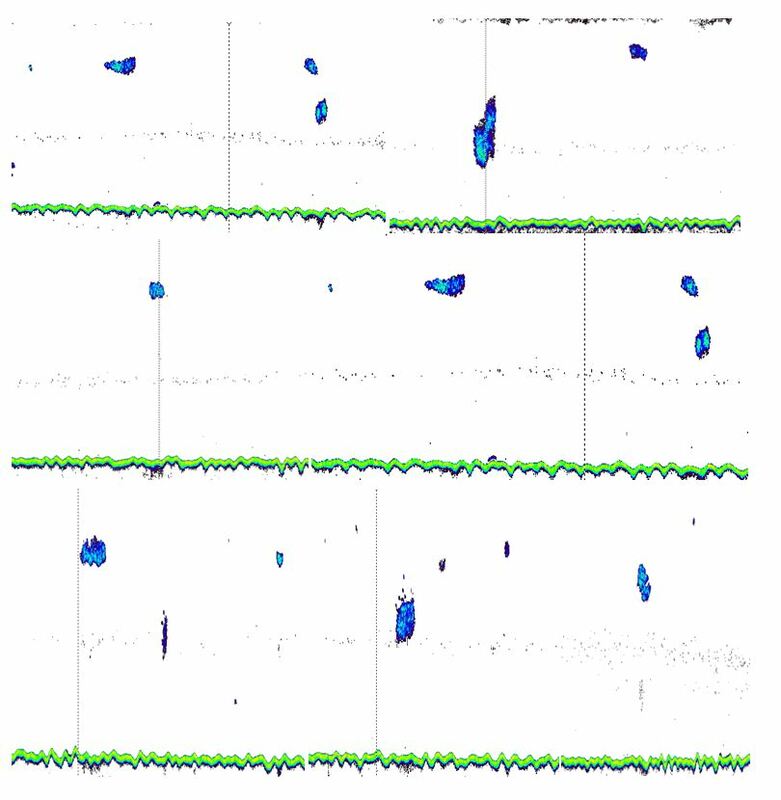 A collage of separate echograms taken from alongshore transects run from July 18 to 19, 2012 showing examples of the various sizes, configurations, and depths of barred sand bass aggregations identified by Echoview 5.2 software based on a mean target strength of -35 db. Depth scale is 1 – 25 m.
Figure 4. 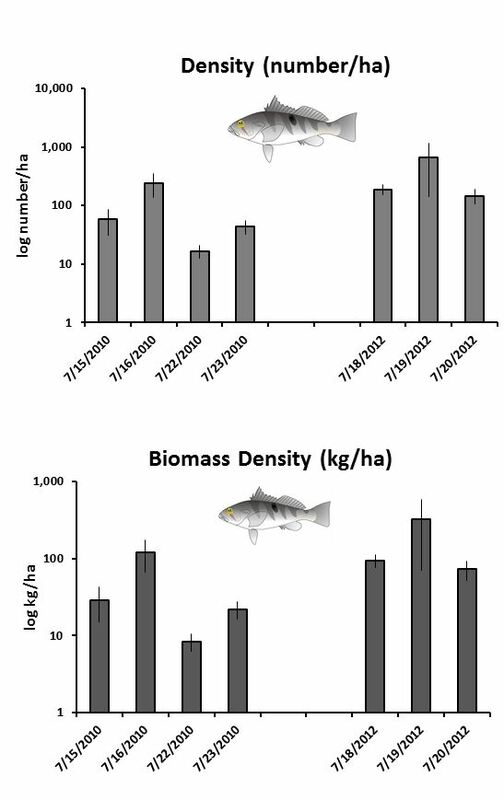 Mean numerical density (upper – #fish/ha) and standing stock (biomass density lower – kg/ha) of barred sand bass (BSB) for four days in July 2010 and 3 days in July 2012 over the Huntington flats area as determined using BioSonics DT-X hydroacoustic transects. Error bars denote SEs from the mean of between 10 and 18 transects for each cruise date.